After importation in 1928 of a Boeing 69-B (F2B-1) by the Imperial Navy, and, in the following year, the fourth Boeing 100 (essentially similar to the F4B-1), the two aircraft were shown to industry as examples of the then-current US shipboard fighter technology. Nakajima, which had previously built the Gloster Gambet (A1N1-2) for the Imperial Navy, initiated development of a carrier fighter based broadly on the Boeing design as a private venture. Responsibility for the fighter was assigned to Takao Yoshida and two prototypes powered by the Jupiter Vi engine were completed in December 1929. Evaluated by the Navy in the following year, these prototypes were rejected as they were considered to offer an insufficient improvement over the A1N1. Some redesign was undertaken by Jingo Kurihara, and with a 580 hp Kotobuki 2 engine, a further prototype was completed in May 1931. Another prototype followed later in 1931, the type then being adopted by the Navy in April 1932 as the A2N1 (Type 90). The aircraft had a fabric-covered metal fuselage and a similarly skinned wing of mixed construction. The principal production version was the A2N2 (Type 90-III) differing in having five degrees of dihedral on the upper wing main panels. Series production was undertaken from 1932 until 1936 by both the parent company and Sasebo, about 100 Type 90 fighters being manufactured in three models (I-III). The A3N1 was a two-seat training derivate of which 66 were produced between 1936 and 1939. The Nakajima A2N was used on the carriers Hosho, Kaga and Ryujo. It was also used by the Kure Kokutai. 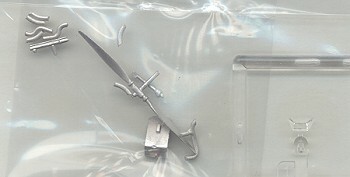 Fine Molds has been known over the years for producing some very interesting types. Though they look like Hasegawa kits, they are not, being produced by others. Hasegawa only provides the production facilities. 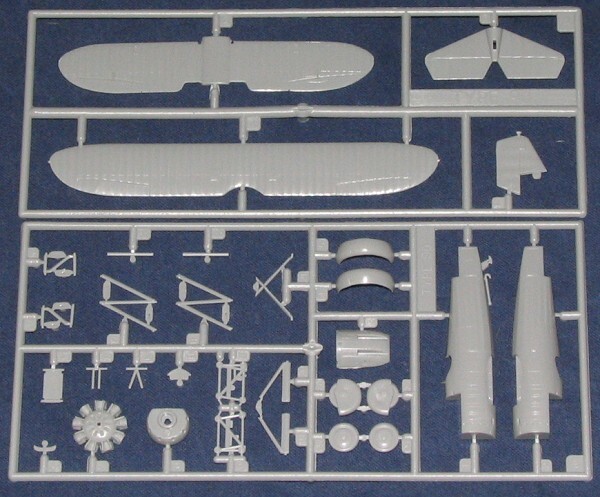 Having said that, the kit looks like a Hasegawa product from about 15 years back. Nicely molded with fine engraved panel lines, a bit overly done fabric representations, a simple cockpit, somewhat generic engine and a bag of cast metal parts. Yup, cast metal parts for the seat, prop, gun sight and the individual exhaust pipes. Makes for some rather teeny bits. Your only real options are the use of open or spatted wheels. I recommend the open versions as there are sink areas on the spats. There is also a clear windscreen. Instructions are completely in Japanese but there are well drawn construction steps to get one through the process. A umber of smaller help drawings are also included. This means a nicely done rigging diagram as well. This will mean visual assistance for most of us as this is very much a small aircraft, about the same size as a P-12. 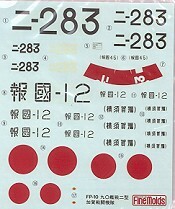 Decals are provided for two aircraft, One from the Kaga fighter group as shown on the box art in aluminum with black cowl and red tail. The other is from the Yokosuka group with spats and no red tail. It seems to be a presentation aircraft ,but I may be wrong about that. Decals appear well printed so it will be interesting to see how well they work on the kit. Interwar biplane fighters are difficult enough to come by in mass market kits and Japanese ones are even more rare. This will appeal to a lot of folks who want to do something a bit different from the norm and should result in a really neat little plane. Thanks to http://surfcity.kund.dalnet.se/a2n.htm for the background info. If you would like your product reviewed fairly and fairly quickly by a site that has around 300,000 visitors a month, please contact me or see other details in the Note to Contributors.